I feel like the Cheshire Cat! 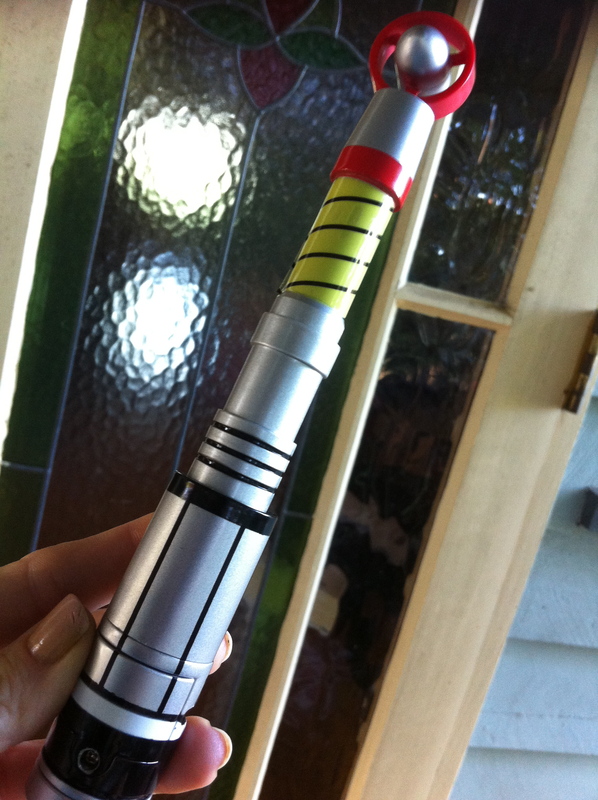 Yesterday I received my very first Sonic Screwdriver. While it’s from the Third Doctor Jon Pertwee, who played The Dr from 1970-74, my childhood recollections of the Fourth Doctor Tom Baker (1974-81) are much more prominent. Funnily, I read that the device was greatly downplayed during the Fourth Doctor’s early seasons but saw a resurgence in 1977 with a new producer. In the final story of season 15, The Invasion of Time, Tom Baker conceded, “Not even the sonic screwdriver can get me out of this one.” I actually remember that episode! I suppose during that time we had other icons including K-9 and Sarah Jane Smith to distract us from not noticing the Sonic Screwdriver. So what have you ever needed a sonic screwdriver for? Get you out of a tight spot? Escape from an alien invasion? I did try to track alien life in my kitchen last night (actually to get the rat from under the fridge that my cat Ollie brought it in just as I arrived home). … but that failed! Other television memories that I have from that time period (and funnily enough a lot are from BBC/ABC days), are watching grass grow at Test cricket matches, The Goodies, Dad’s Army, and some American favs Doris Day, The Banana Splits, Mr Ed and Lost In Space… and listening to The Bee Gees and Cliff Richard, and maybe Herb Alpert/Tijuana Brass and Tom Jones (I had elder sisters OK)! Sadly another two wonderful singer/songwriters from my youth lost their battle with cancer this week, Robin Gibb and Donna Summer. If only the Sonic Screwdriver could delete this horrible disease.